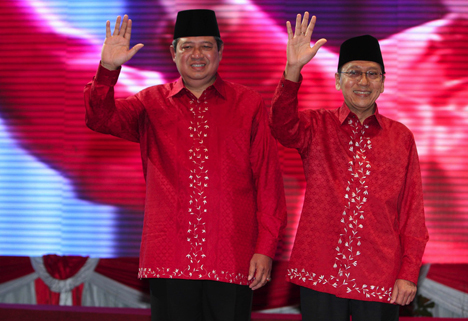 SBY has chosen his running mate, the Governor of Bank Indonesia, Boediono. Who, I hasten to add in the style of the American press, "like many Indonesians uses only one name." I guess we can get used to this phrase because we're going to see a lot of it in the future, assuming current predictions of an easy victory for the incumbent hold true. with a great reputation for clean and capable macroeconomic management. to run Bank Indonesia." SBY ate that right up. that he "doesn't represent Muslims." These are weak complaints. macroeconomics and real world conditions. And to the extent that he is a neoliberal, that just might be a good thing. The complaint that he doesn't represent Muslims is even sillier. At the end of the day, the four Islamic-affiliated parties that support SBY (they hoped that this would give them a VP pick, and accordingly were the ones fussing about no Muslim representation) have all now fallen into line behind SBY-Boediono. The other two official tickets are Megawati Sukarnoputri and Prabowo Subianto (PDI-P and Gerindra) and Jusuf Kalla and Wiranto (Golkar and Hanura). I have fewer positive things to say about these two tickets. I don't trust Mega to govern well, Kalla to govern cleanly, or Prabowo or Wiranto to uphold the rule of law. Here's another press mention of Thursday's research presentation. I should note that if this author were my student, I would report him for a violation of academic integrity for improper use of quotation marks. The author also seems to miss completely the point of our research, misinterpreting both the findings and our interpretation of them. Hmm, yeah that’s not really a great summary of what you’ve been doing. And what’s with the matching outfits in that photo, is it some kind of campaign strategy?